Dubrovnik Cable Car brings you to Fort Imperial, simply a breathtaking vista point. Collision of the coastline with the mountain ranges creates the unique mixture of Mountain and Sea air at Dubrovnik Hills. Thus the perfect mixture of salt sea air and fresh mountain breeze arouses the senses and rejoices the soul and the body. Many believe that this uncommon, pure, air combination found at Dubrovnik Hills revitalizes and heales the whole body. It is no wonder then that this region of Dubrovnik is flourishing in new developments as SPA resorts, villas, appartments, and weekend houses are sprouting out all over the hillock tops boasting with their unparalleled views of Dubrovnik, the Adriatic Sea, and the whole pictoresque area that surrounds Dubrovnik. 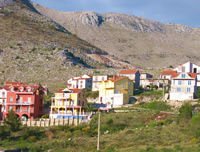 As media attention slowly turns towards this small border-place overlooking Dubrovnik's pictoresque Zupa Region the beautiful villas continue to sprout up on the hillock-tops just as the real estate market encounters steady increase in value.